If you know anything about me as a person, you will know that I am not easily impressed. Plenty of people can give a sermon, but not everyone can back it up. The chapel services this year just keep getting better and better. It was announced last week that on Monday an illusionist would be performing for us during chapel. I come to find out that this certain illusionist actually has a movie, so a group of friends and myself decided to watch his movie the Friday night before to see what it was all about. And that is when I discovered a very cool thing about this guy. The movie turns out to be part dramatization of the story of his life and part of it was actually from a live show he did. I won’t spoil the movie for you, for I highly recommend you watch it, but during one part of the film I notice that he is doing rope tricks that look really familiar. That’s when I learned that this illusionist was actually from the same area I am. And in the movie he is telling the story of how he got into magic as a young kid from watching a magician perform at his church. As it turns out I recognized the rope tricks because the same magician that was his first mentor also came to Awana at my church and did tricks for me as a kid! Which I of course thought was very cool. (Talk about nostalgia. I always loved it when that magician came and performed for us as a little kid.) So of course when I found all of that out I was really excited that this other illusionist was coming to perform for our school. 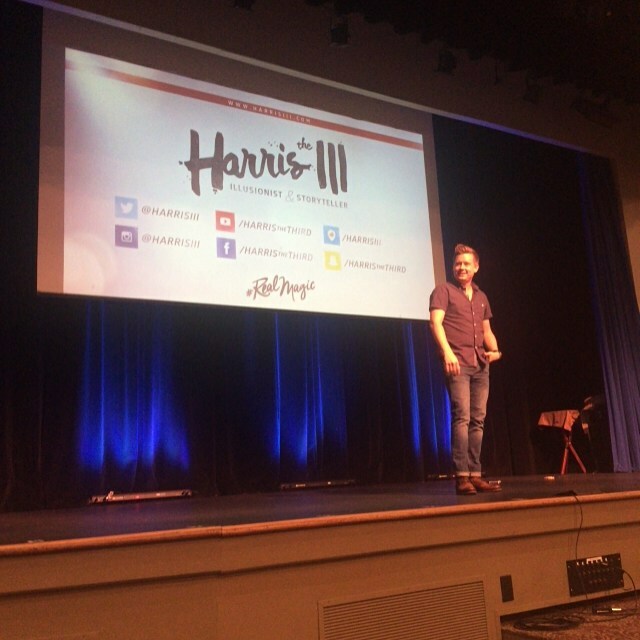 Harris III is a brilliant illusionist and a masterful story teller. Ask anyone walking around campus today and they will tell you that they were both thrilled and inspired by what Harris III showed and talked to us about today. 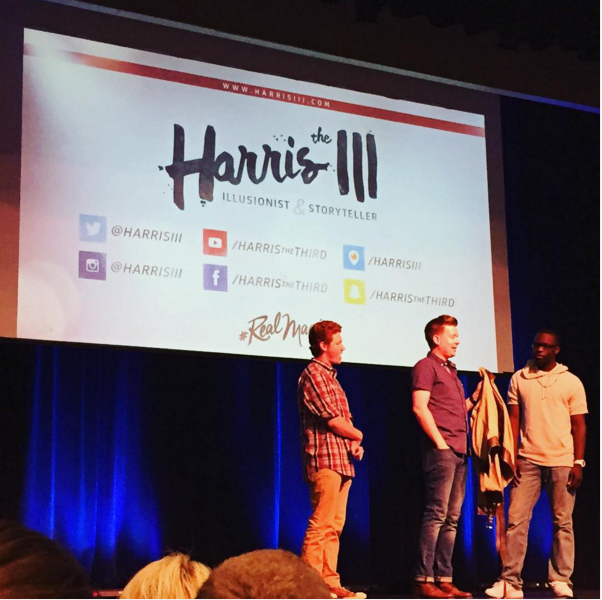 I was discussing it with my own brother afterwards , who is a Christian ministries major,and he was saying how he really liked how Harris III used the illustration of a straitjacket. And how it represents that there are lies in this world that we tell ourselves that will trap us. But truth is real, and the truth in Christ will set you free. And this illustration was that much more potent since Harris III had demonstrated a straitjacket only seconds before. And he didn’t just hold a straitjacket up and point at it while he talked. He actually had a couple students from the audience tie him up in the straitjacket. And then he escaped from it. Did you know, just like Houdini, you have to dislocate your shoulder to escape from a straitjacket? Yeah, I just watched a guy dislocate his shoulder on stage. And I will definitely be planning to attend another one of Harris III’s shows in the future!